Proof is Downtown pub tucked away on Chaplain Lane at the old Mercury Bar location. 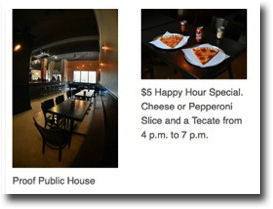 Featuring a rotating selection of draft craft beers, artisan pizza, and a pool table, Proof is a traditional styled pub-- a family friendly bar with a satisfying menu. Offering something for everyone, Proof provides a relaxed environment, serving affordable cans of lager and slices along side house made tapenade and Belgium craft ales. Proof has already begun gaining a reputation for its unique pizza topping combinations, such as Kim Chee Fried Rice and Chicken and Waffle. The dough for the roma style pizza is made fresh daily and ingredients are sourced locally when possible. As Proof is the brother establishment to Downbeat Diner and Lounge, the menu has extensive vegetarian and vegan alternatives as well as a gluten free crust option. The kitchen also sells slices till 2 a.m. Proof features lots of slice varieties and a slice/salad combo, making it a great new addition to the Downtown lunch scene. 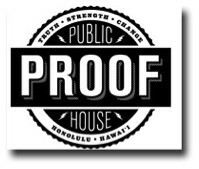 Proof's moto --Truth, Strength, Change--refers to the different types of proof. Proof as evidence and imperial fact (truth), proof as alcohol percentage (strength), and proof as yeast fermentation (change). These three types of proof are central to the business in their specific form, with their broader terminology serving as guiding principles.